prices depending on your individual needs and preferences. Big or small, we move ’em all. We do corporate moves, residential moves, office moves, and of course, apartment moves. If it can be moved, we can help. We know there are fly-by-night companies out there, but finding a quality moving company in Plano or Allen can be tough. 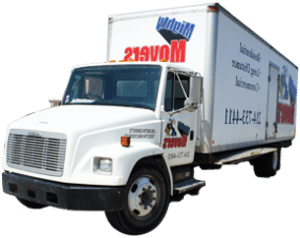 There are hundreds of Dallas moving companies, Plano moving companies, Allen moving companies, and McKinney moving companies, and picking one isn’t easy. We’ll give you a firm estimate before the move, and you’ll know what your costs will be. Our moving trucks are modern, and we have the equipment to accommodate any move, big or small. We never combine loads, and we never swap trucks. If you’re looking for long distance movers, that means the crew that loads your truck will unload it. Our movers are full employees, not contractors and certainly not day laborers. Our guys are trustworthy. There’s so much to say about Mighty Movers that’s great! These guys are thorough, professional, friendly, and honest. Nick, the regional Sales Manager, exceeded my expectations in customer service. There is nothing fake nor slimy about his approach and was willing to work with our tight moving budget. Brian, the gentleman who actually came to give us our quote was quick and to the point. Most movers take anywhere from 45 mins to an hour and with a 3 and 4 yr old I do not have that kind of time. He was there to check on the guys who actually loaded our things and was the one who drove our belongings from TX to Georgia. Mighty Movers are not your average movers. Each of our employees is held to high standards to ensure you receive the best possible customer experience on your move. We credit our clean-cut and knowledgeable crew with the high volume of repeat business we experience at Mighty Movers.